Note: This guide is for advanced users only. This is because the XLR will be located on the VPS wallet and you need to save a backup of your key (or save a backup of the wallet.dat file). - a VPS with minimum specifications: 1 GB RAM, 1 Core CPU, 20 GB HDD. This script will first update your Linux software and then upgrade your packages. Press ENTER or default option for any prompt you're shown. Next, the script will download and install the Solaris wallet. It will also populate the configuration file to contain the necessary parameters. if you see "error: Loading block index...", try again in a minute. Run the commands below with a SPACE before the command to prevent them from being saved in the bash history. Note: Save the encrypted key and password somewhere safe. Do NOT lose either. You may use the same password as for the previous step. The command may take a bit of time to execute so be patient. While the wallet syncs, send coins from your local wallet to the VPS XLR address you generated above. Note: '0' unlocks the wallet until it's closed. 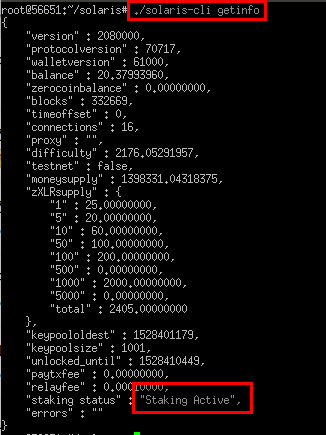 You may enter a number instead of '0' which will represent the number of seconds until the wallet automatically locks. Ex. running the command with '9999' will unlock the wallet for 9999 seconds. If all went well, every field should show as "true" as per the image below. If not, see "Troubleshooting staking status" at the bottom of this page. You are now staking, well done! 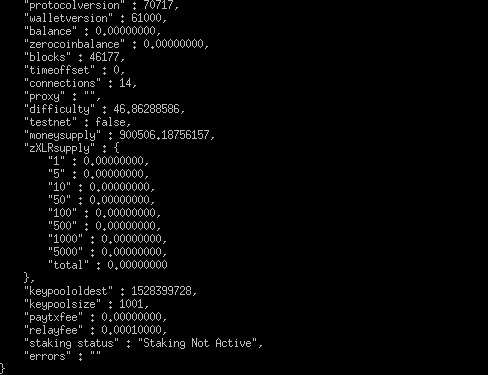 - "mnsync=false" --- masternodes data syncs last so be patient and wait for this to turn "true"
Note: If staking status is still "false" then restart the wallet and unlock it again.